and then I couldn’t leave the poor machine alone. I got the freezer paper out yesterday and decided to make a few more stencils with my Silhouette (just like the post here)……….but for shirts this time. The freezer paper technique (also shown here and here) really is a lot of fun. And can be done with an X-acto knife and your own traced/drawn image. But the Silhouette cuts a great and precise line for you……saving a ton of time. A simple tee with some foliage on the front. I made the foliage look washed out…….more faded looking. And then some little mary jane shoes on a tee for my little girl……..
With dainty fabric flowers on them. Simple. And then I used a little heat transfer vinyl too. It made the cutest little hat with flower. The Silhouette and I have had a grand ‘ol time. Maybe I should give her a rest? Nah. Would you like to see how I made all 3 Tees? I removed the bows in the program and stretched them to make them more narrow. Then I cut out a piece of freezer paper, layed it shiny side down on my sticky mat, slid it into the Silhouette, and then told the program to cut my image. Then, since I’m making a stencil, I need the negative space. I carefully peeled it back off the mat, along with the other little pieces inside of the shoe……..
EDITED: Confused about what Freezer Paper is? Click here to find a whole post about what this stuff is. Then I used some fabric paint (just like the paint used here) and a foam brush and applied the paint a little splotchy. I was going for a more textured look but you can apply your paint evenly to get a solid color. After the paint dried, I peeled back the freezer paper……placed a thin piece of material over the painted image, and ironed it to set the paint. Then, I cut out about 10-12 little cotton circles to create each flower. You could use knit too. Then I cut out little leaf shapes from some knit fabric, that would accompany each flower. I placed each flower with their leaves down on the shirt where I wanted them, then removed the flowers and zig-zagged around the leaves, securing them to the shirt. Then I placed the flowers back down and hand-stitched a little pearl through the center of the flower and the shirt, securing everything in place. I made a stencil for this shirt with freezer paper, the same way that I made the one above. I used two different vine images and manipulated them just a bit to fit on my shirt how I wanted. Then I peeled back the negative space. Again, peeling back the freezer paper from the sticky mat will cause it to curl up. Just carefully place it where you’d like it………. ………..and then start from one end and gradually iron down piece by piece, flattening the freezer paper down as you go. Until it’s all ironed down. Then I used fabric paint and filled in my stencil, using the splotchy look with my foam brush. Then I removed the paper and heat sealed it, just like I did above. 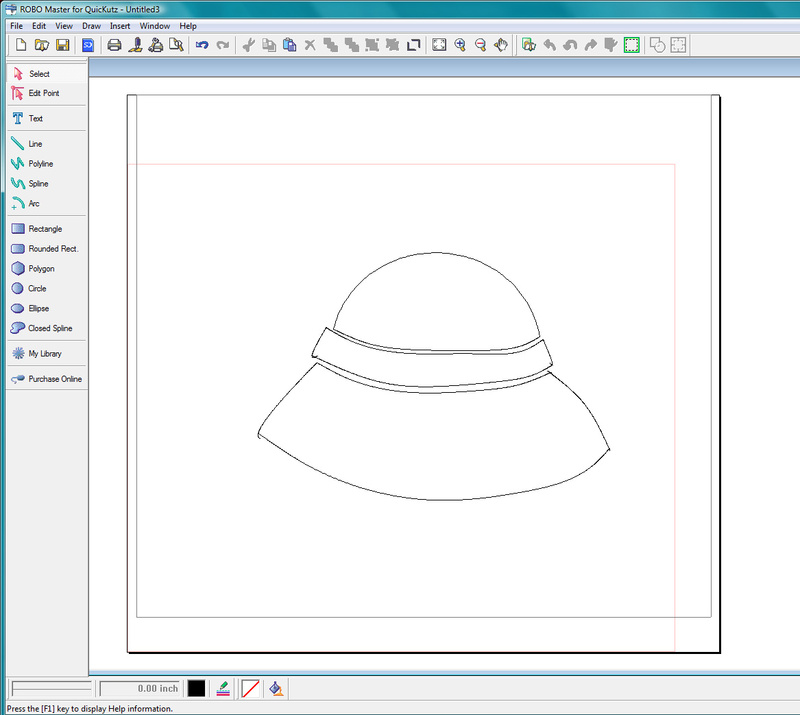 For this little hat shirt……..I used the SIlhouette program and used the shape tools to create a little hat shape. This is just a screen capture below, and it shows the little tools that you can use along the left side, to create any shape you want to. My shape is full of flaws, but once it’s cut out, you can’t tell one bit. Keep that in mind…..don’t try to make it perfect! 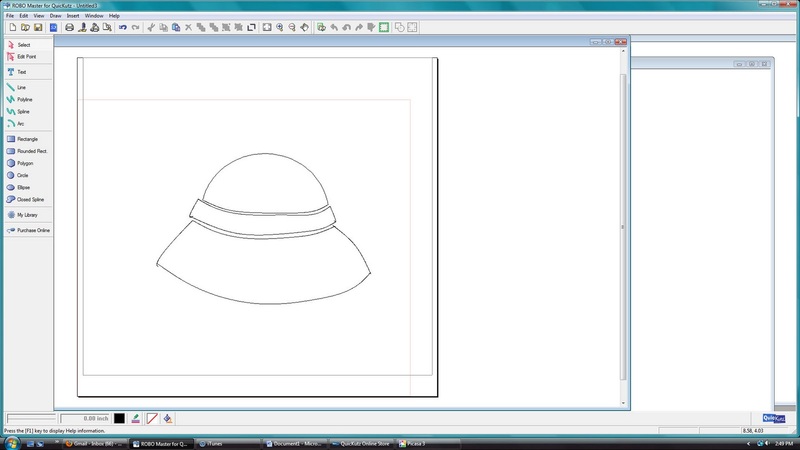 Then I used the Silhouette machine to cut out the hat shape, and then ironed it right to the shirt. Then attached it to the hat. Done. And that’s it. A few new Silhouette ideas for you Silhouette owners. Again, I’m sure these basic concepts will work for you Cricut owners……I just haven’t played around on one at all. these are fantastic! I just got a silhouette for Christmas and am chomping at the bit to try some of this! I love your blog, and I love my Silhouette. I just got some freezer paper – so I'm glad you posted this today! All of your projects are great. I don't understand. When using normal freezer paper (The vines one specifically) where does the sticky backing come from. Freezer paper in my grocery store does not have a backing. You seriously inspire me. I have had my Silhouette for months and haven't used it for anything but vinyl and cardstock. I even have 2 colors of heat transfer on hand. Time to make some clothing! Okay QUESTION – you keep talking about it but I have no idea what it is…. what is FREEZER PAPER? Where do you get it? Do you use regular vinyl with freezer paper? Do you mine writing a brief post about it. I have a vinyl cutter (very large industrial size) and would love to do designs on clothing. What do I need for it? I've never tried Freezer Paper, I can never find it! I use contact paper instead, and cut it on the same settings as vinyl. Then stick the sticky side onto the paper, and use a popsicle stick or bone paper folder to make sure there's no air bubbles. Black Contact paper also works as a good substitute for black vinyl! I love all three! Freezer paper stencils are my favorite thing about my Silhouette so far. Also, it seems to keep the stencil (or whatever else you're peeling off) flatter and less curly if you bend the cutting mat away from the cut material instead of pulling the material away from the mat. So I put my mat on the edge of the table and curl it down while holding on to the material to keep it more or less straight. I saw this tip somewhere, and it works really great for the most part. I LOVE the little shoes and the floral one! I can't wait to buy a Silhouette – or at least win one! How do you get your freezer paper not to stick to your cutting mat? I love the idea of embellishing your designs – hadn't thought of that. The shoes are too cute! Oh how I love the mary jane shirt! The embellished shoes are sooo cute! I need a Silhouette! Those shirts are so cute! Do you know if a a Cricut would do the same thing as a Silhouette? I think freezer paper is what I know as grease-proof paper. I only have baking paper at the moment though – would that work? Can you iron it? These turned out so great! I'm a huge fan of freezer paper stencils. I wish I had a Silhouette though, I tend to develop rage issues trying to cut out my stencils with an exacto knife. Thank you so much for the silhouette tutorials – there's not much that i can find out on the intertubes right now. thankyouthankyou!! I'm so glad you posted this, especially with the melted satin flowers. In my head, I thought that I read that you used silk. For Christmas I made my baby the cutest purple booties to go with her dress and wanted to do the flower near the toe. I used a lighter on the silk, but the edges would NOT curl! Now I know why and satin should be a lot cheaper than silk! Just for your information, though, even though the flowers did not curl, it helped seal the edges and they look PERFECT on the booties! Just got a silhouette and for some reason I was stumped about what to make, so I will definitely have to try it out! I love the gray shirt! I just ordered mine using your code and I am so exited! I wish it was here yesterday rather than having to wait because I have so many things I want to do with it! Thanks for sharing some fun ideas. Love all of these! My one problem, I have not been able to find freezer paper anywhere, does the package actually say "freezer paper"? these are some of the best I have seen thanks for the awesome ideas!! I like them all, but I think the hat one is my favorite! this is freezer paper! found it at my local Wal-mart, along with all the foils and plastic wrap! I have searched high and low for freezer paper too. Has anyone found it in Canada? And thanks for the link, Kim. That may have to be how I get it!! love these shirts! especially the mary janes! love, love, LOVE the Mary Jane shoes! too cute! Adorable!! I love these ideas! Love your tutorial! I can't wait to try it myself. I put a link to your post on my blog. are the vines and mary jane shoes just painted on after the freezer paper is applied? If so, what type of paint is used? I orded my silhouette 2 days ago! I'm so excited to give it a try! And I have about 300 feet of freezer paper in my kitchen so as soon as that cutter gets here I'm set! you have the most amazing, inspiring ideas! love the shoes and hat shirts…don't have a silhouette, but maybe i could just do it with fabric? Just wanted to add a little tid-bit for those of us who own a Cricut Cutting Machine. There is a program that you can purchase online that will allow you to cut out ANY shape you want – even hand drawn ones (similar to the Silhouett's computer program). It's called "Sure Cuts A Lot". I found it for about $75, but you are allowed to download it onto two computers, so I went in halfsies on it with my sister in law. Sure Cuts A Lot also uses ALL the fonts on your computer, so you can cut out a wide variety of vinyl sayings for your walls that are much more creative than the Cricut cartridges themselves. You simply design your item you want cut out, plug the Cricut into your computer, and cut! YAY! I'm addicted to your site! You have the cutest ideas. I LOVE the Mary Janes tee for my two girls, but what about my two boys? Do you have any cute monster ideas???? What a fantastic idea. Love it!! and can't wait to try it. I'm in Australia and don't recall seeing 'freezer paper'. Does anyone know if it is called something else here??? I’m in Oz too and you might have found the answer to this by now but just in case you haven’t … Spotlight sell freezer paper by the meter. You have to ask for it at the fabric cutting counter as they usually do not have it out for display – from memory about $1 – 2 per meter! I love my Silhouette, too! I just got rolls and rolls of heat transfer, in quite a few different colors, and some are flocked. I might not sew the shirt because I don't have a machine, but I certainly will iron on some cuteness! Would you mind sharing the settings that you used in your Silhouette for the freezer paper? I'm struggling a bit with mine as it keeps cutting through all of my vinyl and paper backing. kristen- For the freezer paper, I use the blue cap cutter and then just use the vinyl sticker setting. I use the same cutter and settings for the vinyl and it doesn't seem to cut through my paper backing on the vinyl. If changing your settings doesn't help and are still having problems with it, I would definitely call Silhouette. Maybe they have some more suggestions. Their customer service has been excellent! 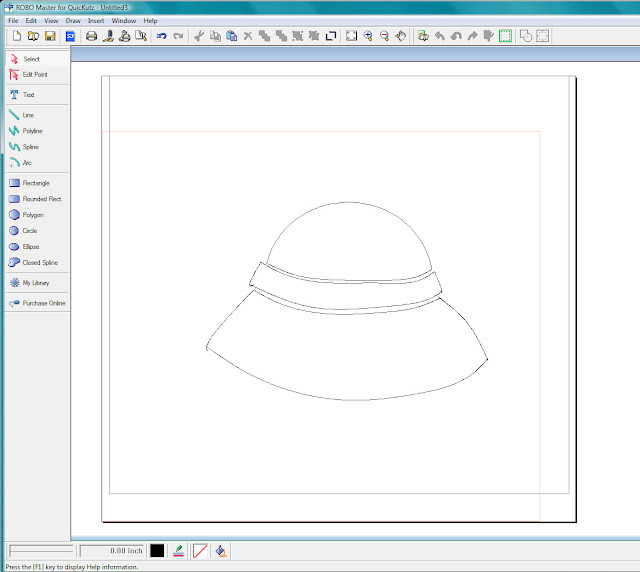 Another option for people with cutters is Make the Cut – it is a program where you can download free images to your computer and Make the Cut will let you manipulate them and cut them out. I can use my Cricut, but there is a lawsuit now and not sure if Make the Cut is compatible with a Cricut anymore. Have you ever done a stencil with two paint colors where you have to put the second color on top of the first color? Can you iron the freezer paper onto the first paint color once it has completely dried? I want to paint a white bunny with pink ears & nose. Love your blog, so glad you share with the rest of us. Yes, I'm sure you iron the freezer paper over top the paint. The freezer paper attaches quickly and without even needing that much heat. So just make sure your first layer of paint is completely dried, place fabric over the dried paint and heat seal the paint with the iron, and then do your second stencil of freezer paper. Good luck! Love it, love it, love it!!!! Just came across freezer stenciling – looks like so much fun. Thank you for posting your great designs!!!! the more and more i look at these… the more and more i think i need a silhouette machine. NEED. not want. NEED! Thank you so much for this! I just received a Silhouette in December and I’ve been wanting to try freezer paper stencils with it forever. I just made two baby onesies and a shirt for my best friend and I LOVE how they came out! Awesome tutorial. Wondering what settings you use to cut the freezer paper. Light paper or did you customize? In fact, I love all the projects in this post – – you have me excited about using freezer paper to make stencils! So fun. I just got a Silhouette for Christmas. What settings did you use for the freezer paper? What kind of paper did you use to make the little grey hat? Is that freezer paper too> Did you just print on it?